As a follow-up to a previous post, below is a map showing White Island from the collection at the Boston Public Library. 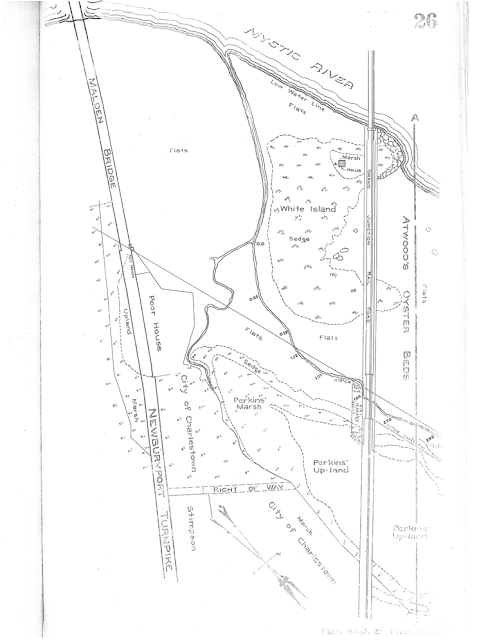 And a friend of Mass Oyster has supplied survey maps of Atwood's oyster grounds in the Mystic River. Several of our public servants have doubted the presence of oysters in the Mystic River. Hopefully the growing body of evidence will convince them otherwise. 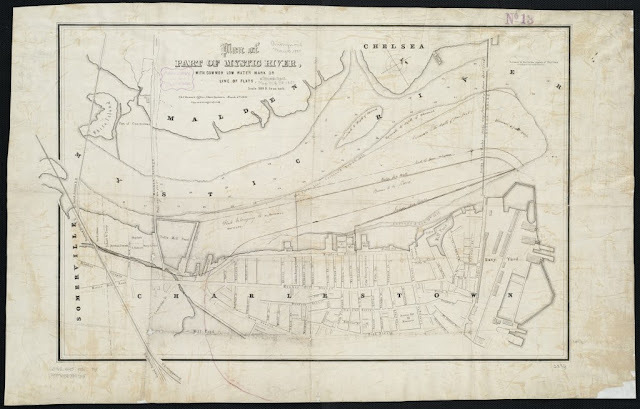 We are always intrigued by the extensive and forgotten history of oysters in Boston Harbor. It is important as the context of the discussion around oysters in the Harbor should be around restoration; bringing back a historic resource. Thus we were pleasantly surprised to hear from a friend of Mass Oyster about Hawes Atwood, his oyster grant in the Mystic River and his restaurant, which is now the Union Oyster House. Atwood is a name that one frequently sees when looks back into the history of oysters in the state, with the name popping up on the Cape, Boston and Cambridge as well as other places including a prominent Boston Lobster Pound. According to our research in 1816 the Basement of the Cambridge Townhouse was rented to Zenas Atwood for storing oysters. According to a History of Everett "Hawes Atwood, one of the prime movers in the town’s fight for separation from Malden was an oyster merchant with offices at 41 and 48 Union Street, Boston and he and W. Atwood owned eight acres on White island 37 acres on the flats and 2 ½ acres on the marshes from which they extracted oysters." According to a history of the Union Oyster House on a National Park Service Website. 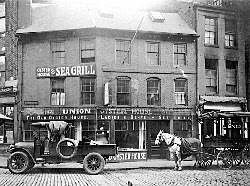 The Union Oyster House is both the oldest restaurant in Boston and the oldest restaurant in continuous service in the country-its doors first opened to diners in 1826 when it was founded by Hawes Atwood. At that time, the building was much closer to the water, so the oysters could have been delivered by ship. 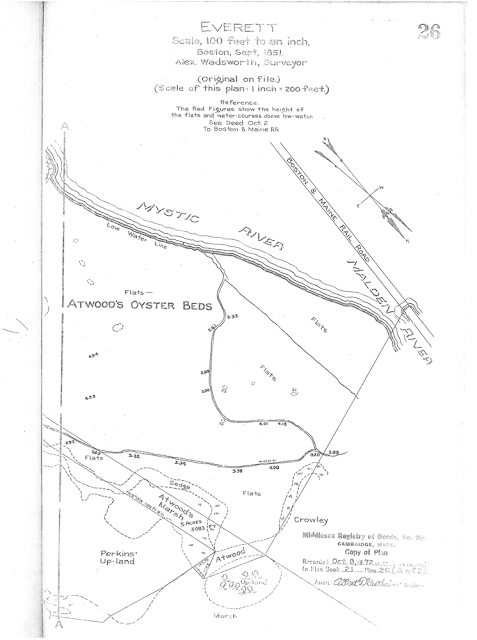 The Atwood family is known to have operated a number of oyster shops in Boston since at least 1818. Originally known as Atwood's Oyster House, the restaurant became Atwood & Hawes from approximately 1842 to 1860 and Atwood & Bacon from the late 1800s to 1916. At this point, it is believed that the open coal range on which oysters were roasted was installed in the kitchen. By 1916 the establishment was simply referred to as Union Oyster House, the name it holds today. To this author's mind one of the best aspects of the Union Oyster House is the circular raw bar on the ground floor. Nobody knows exactly how old the soapstone structure is, but they do know it was covered with copper in the 1940s. The oysters are shucked to order. The bar and stalls are a foodie Time Tunnel and not to be missed. Even though the food product may be equal, faked ambiance in a McCormick & Schmick's cannot touch the real experience of enjoying an oyster in an architecturally true environment. 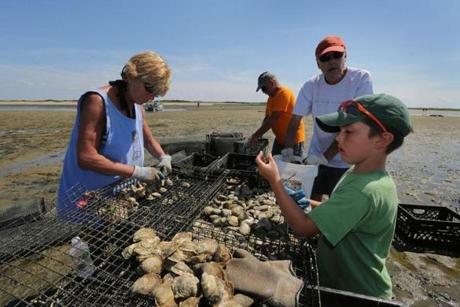 We were pleased to see another oyster farm opening on the Cape for three reasons. First, a healthy oyster industry is good for our economy and creates jobs. Second, oyster growers are advocates for oysters. And finally, oyster growers can be terrific advocates for ocean health and cleanliness. We try to support the industry and new farmers such as Big Rock oyster company who will be supplying oysters for our September 15th craft beer and oyster event at Plymouth's Mayflower Brewery. Register here. Given the right tide conditions and time of day, They can take groups of two to thirty-two out to the flats for an in-depth look. Participants learn about planting the seed clams, racking the oysters, floating the oysters in tidal waters, spreading the oysters on the sand so they get the desired “cup”, and finally, digging the clams and checking for the size of the shellfish for legal limits for harvest. You can even dig your own clams and forage for oysters just like at a pick-your-own apple orchard. Frequently they’ll find seals lying on the oyster grow cages and dolphin pods have traveled past while they work. Check the Cape Native Secrets website for tour availability. Here is the Boston Globe article. John Santos with a Long Pointer. Lory Stewart, John Santos, John Goff, and Myles Santos work the beds. PROVINCETOWN — On a cloudless July afternoon at low tide, John Santos ferries four passengers — one of whom is his wife and business partner, Lory Stewart — across Provincetown Harbor to the 2-acre aquaculture grant (Grant No. 5) where the couple began farming clams and oysters four years ago. Wood End lighthouse beckons straight ahead. Long Point Beach, at the very tip of Cape Cod, sits just to the left. The only visible companions are two seals who pop up to greet the arriving skiff as it approaches the flat. While Wellfleet, two towns over, is practically synonymous with oysters, Grant No. 5 is the only working grant in the harbor and the couple are the first in this town to raise oysters, which they have branded Long Pointers. Santos, 66, and Stewart, 63, took over the grant from Santos’s godfather, Larry Meads, who had farmed clams on the site with his wife, Nancy, for many years. A fourth-generation Provincetown resident, Santos owns Flyer’s Boatyard and Rentals, a business his father founded and his son, Noah, now runs. Though still involved with Flyer’s, Santos says he saw the grant as an opportunity to do something in retirement that would keep him busy without taking up all his time. Stewart is director of instructional technology for a regional school district on the mid-Cape. Once the skiff anchors, Santos heads straight for what he calls his “office,” a pontoon boat anchored on the flats, from which he can see the clam beds, oyster cages, and full sweep of Provincetown in the distance. Stewart leads the passengers onto the flats for a lesson in shellfish farming. This is nothing new for her. In addition to growing and harvesting the mollusks, Santos and Stewart offer eco-tours and pick-your-own clams and oysters. In its first season, the activity is very popular, particularly on sunny days. Standing on the flats, Stewart explains that clams are planted in 10-by-50-foot runs, with about 100 seeds per square foot. She and Santos currently have about 250,000 clams in various stages of development. At planting time every summer, they rake the plots, lay down nets with rebar, then sprinkle seeds, which they get from Aquaculture Research Corporation in Dennis. It takes three years for clams to grow to market size. The nets hold the clams in place and protect them from predators – primarily boon snails and crabs. Periodically, Stewart and Santos have to bring out long-handled squeegees to wipe away seaweed, which can suffocate the clams. After two years they remove the nets, and periodically rake the clams. “It shakes them up. It gives them a chance to wiggle around and grow,” Stewart explains. At that point, the clams are developed enough that they burrow back down into the sand to continue growing. Using a bull rake, Stewart scrapes the sand and picks up a clam. She pulls an oyster and clam gauge out of her bag and places the mollusk inside to measure it. She and her husband are raising littlenecks (1-inch quahogs). “You want them right there [1-inch],” she says. “Those are the most desirable for steaming, for linguine. Non-keepers today should be ready in two to three weeks.” When she and her husband harvest, also in summer, they rake up about 2,000 clams at a time. “Oysters are a lot of work,” says Stewart, walking across the flat toward a group of floating oyster cages. “You have to handle them a lot. Most weekends in May, I stand at a table culling oysters for eight hours each day.” These bivalves take four years to get to market size. Stewart and Santos have 500,000 oysters in different stages of development and their goal is to harvest 20,000 annually. Oysters culled from Provincetown aquaculture beds. The couple’s growing process has “morphed,” according to Stewart. They started with bags of seeds on metal frames. Now the majority grow in floating cages that move with the tidal water. The couple believes this helps develop the desirable deep cup that means a meaty oyster. They are also growing some oysters on racks. And Santos saves empty oyster and clam shells, then spreads them on one area of the flats. The oyster shells give off spat, or natural oyster seed. The oyster larvae attach to the empty clam shells and to polyethlyene plastic “Chinese hats,” named for their shape, which the farmers set out stacked on cylinders. This is a way to create a natural oyster population. Stewart’s and Santos’s clams and oysters are served in restaurants in Provincetown and Truro, in addition to being collected by tourists the couple bring to the flats. Chris King, owner of Cape Tip Seafood, which distributes them, says of the Outer Cape’s newest entry, “It’s coming along great.” He describes the oysters’ taste as similar to those of the neighboring Wellfleet. Shucking an oyster on the boat heading back to town, Santos maintains his Long Pointers taste so good they need no lemon or cocktail sauce. It’s hard to argue with that assessment after slurping one from its shell. As we think about oyster restoration, ocean acidification often arises as an issue to consider and a potential motivation for moving forward. The oyster shell is made of calcium bicarbonate, the same material as Rolaids, and may be able to offset acidification at a local level. There are reports of oysters being helpful to steamer clams. We reprint this article as it discusses the two different species of oysters on the US Pacific Coast. 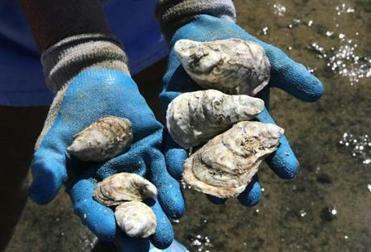 In Massachusetts, we are working to restore a different species, the Eastern Oyster, crassostrea virginica, which is different. 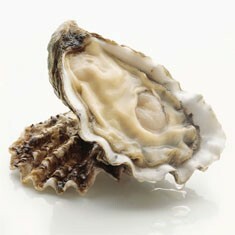 The Eastern Oyster reproduces via the broadcast method. COOS BAY — As a federal research vessel heads out to study the impact of ocean acidification on Pacific marine life, Oregon biologists are reporting both benign and negative impacts on regional shellfish. The National Oceanic and Atmospheric Administration dispatched the R/V Fairweather from Seattle on Monday for a month-long cruise to collect water, plankton and algae samples. The agency is concerned that increasing ocean acidity levels attributed to greenhouse gas emissions are threatening marine ecosystems the fisheries they support. 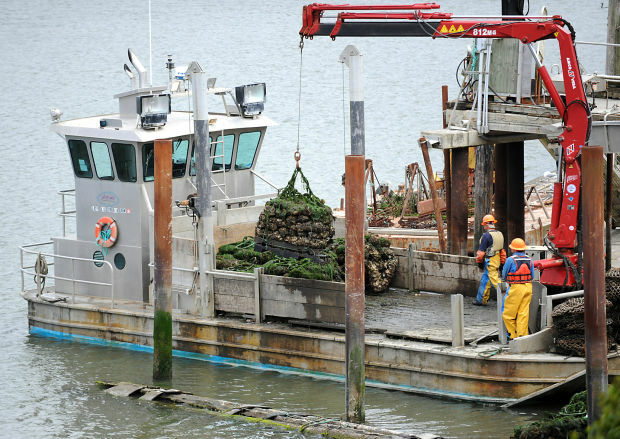 The Oregon coast oyster industry has firsthand experience with the problem. Several years ago, Netarts Bay’s Whiskey Creek Shellfish Hatchery — which produces much of the oyster seed used by commercial farms in the region — began experiencing a decline in production that Oregon State University researchers traced directly to ocean acidification. But biologist Steve Rumrill said the future of the South Coast’s native oyster isn’t looking too bad. 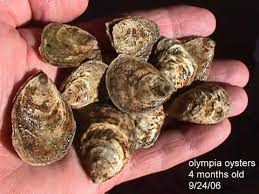 “The short answer is that the native Olympia oysters may be doing OK and recovering in Coos Bay despite ocean acidification,” he said. 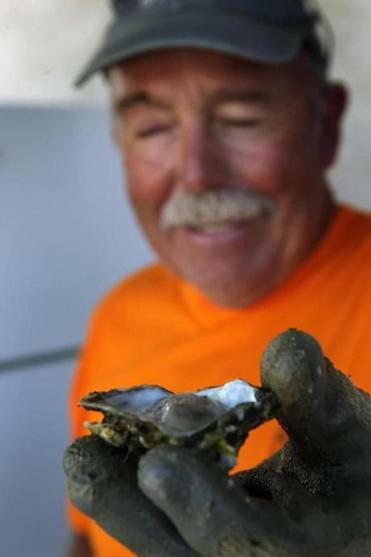 Rumrill, currently the director of Oregon Department of Fish and Wildlife shellfish monitoring program, was instrumental in Olympia oyster recovery efforts at the South Slough National Estuarine Research Reserve near Charleston. “It may be that the shallow parts of Coos Bay may be able to act sort of as a buffer,” he said. Oregon State University Professor George Waldbusser said difference in survivability likely lies in the species’ reproductive practices. “Olympias are brooders,” he said, referring to the species’ trait of carrying eggs in an internal chamber for several weeks after fertilization. ﻿﻿﻿﻿﻿﻿Pacific oysters, on the other hand, are broadcast spawners, meaning their eggs are fertilized and develop in open water. Pacific Oyster- note the characteristic wavy shell edge. 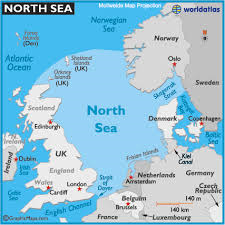 Waldbusser said the native species’ reproductive period is on the edge of the coast’s seasonal upwelling cycle, when deep ocean currents force cold water to the surface. Upwelling is believed to contribute to the acidification process by bringing oxygen-deprived, CO2-rich acidic water to the ocean’s surface. As far as Rumrill’s buffer theory, the professor said one of his graduate students is also conducting research on increased production in seagrass habitat in Netarts Bay. Waldbusser said any findings are likely six months out, at the earliest. Reporter Thomas Moriarty can be reached at 541-269-1222, ext. 240, or by email at thomas.moriarty@theworldlink.com. We frequently see mussels in with our oysters, and are often asked how the two species relate. 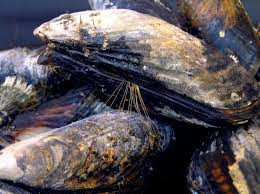 The literature states that mussels like more current than oysters and that oysters have an affinity for brackish water (where there is less salt from fresh water entering the sea.) Nonetheless we frequently see them together with the mussels clinging tenaciously to our oysters. At times in Boston Harbor, we have been a amazed at how quickly they can overwhelm a milk crate or cage container. Mysteriously, they will cover one container, but leave another 30 feet away untouched. This article from the MIT news discusses how the oysters are able to hold on so well. For the record, we still like mussels as they are filter feeders as well and help clean the water. We also like them steamed in a garlic, butter and white wine sauce! Understanding the strength of the shellfish’s underwater attachments could enable better glues and biomedical interfaces. Mussels cling together with threads. Oysters cement themselves to one another. 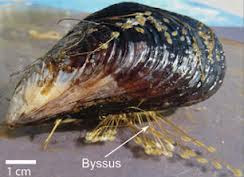 The Byssus Threads have both stiff and elastic properties to resist considerable wave action. Unlike barnacles, which cement themselves tightly to the surfaces of rocks, piers or ships, the clamlike bivalves called mussels dangle more loosely from these surfaces, attached by a collection of fine filaments known as byssus threads. This approach lets the creatures drift further out into the water, where they can absorb nutrients — although in the process, it exposes them to the risk of being torn away by the force of crashing waves. But that almost never happens. Despite the outwardly thin and fragile appearance of these threads, it turns out that in the dynamic, sloshing environment of waves and currents they can withstand impact forces that are nine times greater than the forces exerted by stretching in only one direction. The secret to these tiny natural bungee cords has now been unraveled by MIT research scientist Zhao Qin and professor of civil and environmental engineering Markus Buehler. Their findings appear this week in the journal Nature Communications. Byssus threads, they found, are composed of a well-designed combination of soft, stretchy material on one end and much stiffer material on the other. Both materials, despite their different mechanical properties, are made of a protein closely related to collagen, a main constituent of skin, bone, cartilage and tendons. The team combined computer modeling and laboratory tests on the threads. To carry out their experiments, they placed an underwater cage in Boston Harbor for three weeks, during which time mussels attached themselves to the surfaces of glass, ceramics, wood and clay in the cage. Back in the lab, the mussels, threads and substrates were mounted in a tensile machine designed to test their strength by pulling on them with controlled deformation and recording the applied force during deformation. “Many researchers have studied mussel glue before,” Qin says, referring to the sticky substance that anchors byssus threads to a surface. But the static strength of the glue, and of the thread itself, “is not sufficient to withstand the impact by waves,” he says. It’s only by measuring the system’s performance in simulated wave conditions that he and Buehler could determine how it accomplishes its amazing tenacity. The distribution of stiffness along the threads is key, Qin and Buehler found, suggesting that the distribution of intrinsic material properties and the overall architecture of the mussel attachment are important. The distribution of stiffness in the mussels’ threads enables them to be subjected to very large impact forces from waves. About 80 percent of the length of the byssus threads is made of stiff material, while 20 percent is softer and stretchier. This precise ratio may be critical, the researchers found: The soft and stretchy portions of the threads attach to the mussel itself, while the stiffer portion attaches to the rock. “It turns out that the … 20 percent of softer, more extensible material is critical for mussel adhesion,” Qin says. In their simulations, Qin and Buehler systematically tested other ratios of the material composition and found that the 80-20 ratio of stiff to soft leads to the smallest reaction force. Having more of the softer material increases the reaction force because the material cannot effectively slow down deformation. Moreover, having more stiff material in byssus threads has other advantages, as it prevents the mussels from being pulled too far out by waves, which “would make it easier to hit other objects” and be damaged, Qin says. These findings, Qin and Buehler say, could help in the design of synthetic materials that share some of these properties. For example, surgical sutures used in blood vessels or intestines are subjected to pulsating or irregular flows of liquid; the use of materials that combine stiffness and stretchiness, as byssus threads do, might provide advantages. The researchers say there may also be applications for materials to attach instruments to buildings, or sensors to underwater vehicles or sensing equipment in extreme conditions. The work was supported by the Office of Naval Research and the National Science Foundation. Three years ago, two of our terrific interns did great work identifying references to oysters in Colonial Boston noting that an oysterman was stabbed at the Boston Massacre and that oyster shells were thrown at the British Redcoats in several altercations including the final one that led to the Massacre. In reading through Richard Archer’s book on the British occupation “As If an Enemy’s Country” there are several references to oysters. He confirmed the stories of oysters being thrown. But he included one very intriguing reference. On page 185 he mentions that Boston Streets were paved with oyster shell. We are seeking to track him down for his source for that comment. If early Boston was paving the streets with oyster shells, then there had to have been a lot of oysters. This was a time when moving heavy loads took effort. Historically, one sees oyster shell roads when there is large amounts of oysters nearby. Richard Archer's Book "As If an Enemy's Country"
Yet in the records, there are few mentions of oystermen in Colonial Documents. One possible reason could be that oystermen were not from the highest segment of society and thus you don’t hear them mentioned in the same breath as John Hancock merchant or Paul Revere silversmith. Interestingly there were only a few tradesmen at the Sons of Liberty dinner celebrating the reduction of the Tarriff’s. The dinner was largely attended by the elite merchant class. There is an interesting segmentation here as the majority of those injured at the Boston Massacre were of more humble origins- sailors and people who worked in the manufacture of rope. 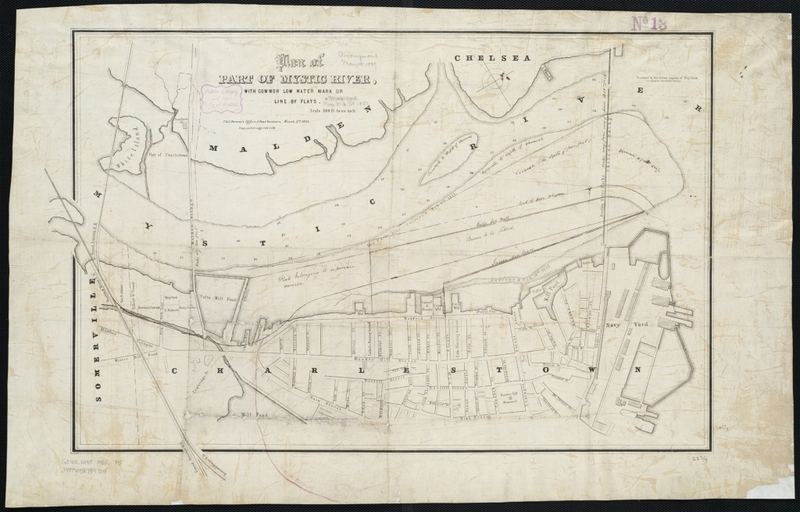 While the oystermen may not have been of the noble class, they were there with a significant business harvesting oysters from the Charles and Mystic River estuaries as well as Chelsea Creek and other spots. Those interns were Laura Olivier and Shira Bleicher. Thanks again for the great work! If we are going to fully restore Boston Harbor- oysters should be part of the picture. We also recently learned of this work in oyster restoration going on in South America. The nature Conservancy is part of this program. As we get deeper involved in this field, their name rises with increasing frequency. 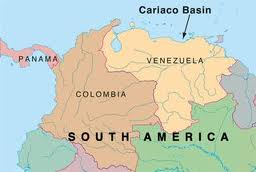 In Eastern Venezuela, restoration work on the Atlantic pearl oyster, Pinctada imbricate, has begun on the bank of Chacopatica, on the northern coast of the Gulf of Cariaco. The goal of this project is the recuperation of the natural banks of these bivalve mollusks, through the incorporation of 120,000 pearl oysters, after overexploitation caused species to become “extinct” as a fishery. 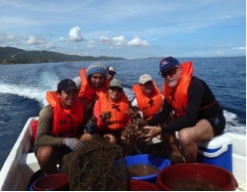 These restoration activities are part of the Research Group on Mollusks Biology of Universidad de Oriente (GIBM-UDO), with the financial support from Fondo Nacional de Ciencia, Tecnología e Innovación (FONACIT). The overall goal is to establish a Center for Environmental Monitoring and Production of Shellfish seeds in the Gulf of Cariaco. The GIBM-UDO is an important academic group in Venezuela which, in association with The Nature Conservancy, trusts in the use of aquaculture to diminish poverty and to conserve natural renewable resources, by means of restoration of the natural banks of mollusks, which are very important ecological, social and economically in the Caribbean Sea region. The GIBM-UDO researcher’s strategy is to collect young–of-the-year pearl oysters from the wild and cultivate them to a stage where they can reproduce. This way, after 5 months of cultivation at the Turpialito Hydrobiological Station, researchers would have individual oysters able to release 3-4 million eggs each, which means a large increase in egg production (potential oysters in the natural environment) - in theory, about 300 billion. 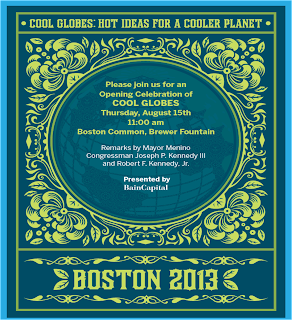 Our friends at Mass Baykeeper are part of an exciting event on Boston Common this Thursday at 11:00 am. They asked us to share the news. Cool Globes is Public Art with a purpose. 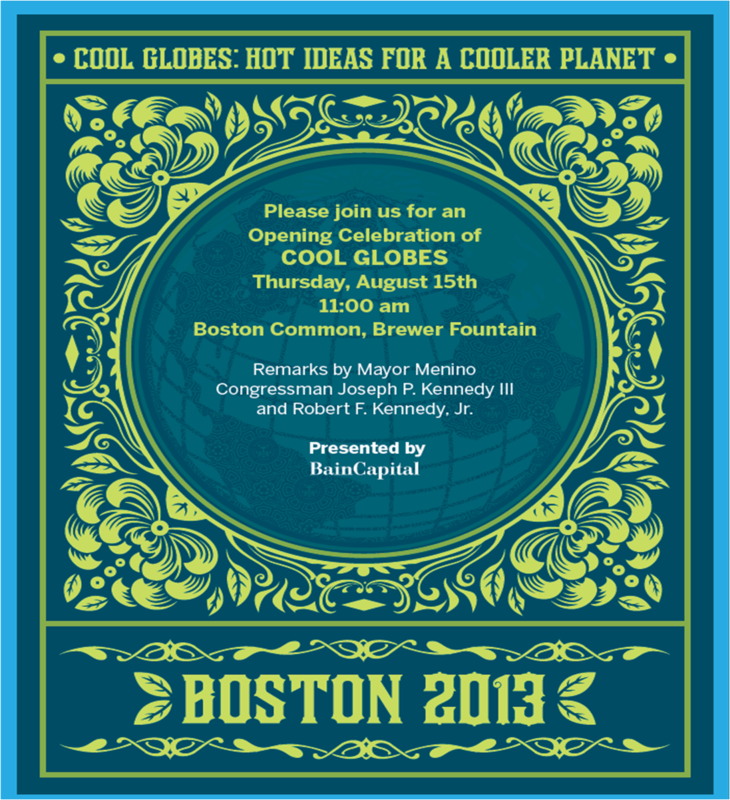 On August 15th Massachusetts Baykeeper will be celebrating the Boston opening of Cool Globes, with Mayor Menino, Congressman Joseph P. Kennedy III, and Robert F. Kennedy, Jr. Cool Globes is a public art exhibition designed to raise awareness of solutions to climate change - one of our biggest concerns! So, please join us on Boston Common August 15th to view some really cool art, hear some amazing speakers, and raise awareness of a very important topic! 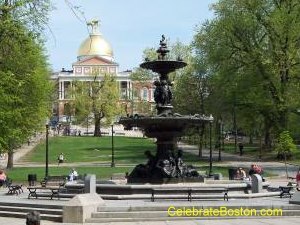 If you work in town, this is a great excuse to take an early lunch and walk on over to the Brewer Fountain at the intersection of Park and Tremont Street. 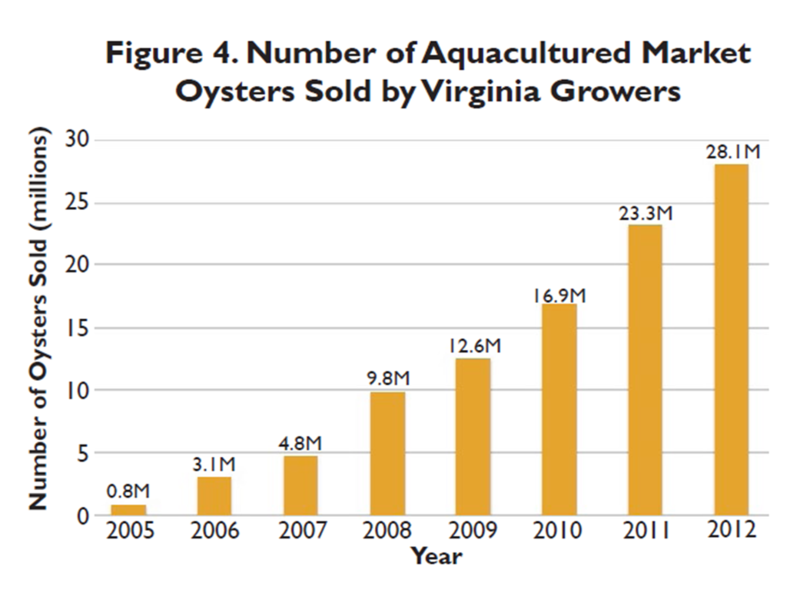 A report on the economics of oyster aquaculture in Virginia was recently published by the Virginia Institute of Marine Sciences. The state's oyster industry has been growing rapidly and is over $9million with over 100 direct employees. ﻿﻿The direct harvest value of $9.6M is 25% less than that of Massachusetts. With over twice the number of oysters sold, the ASP is considerably lower. As to employment 138 direct jobs are directly tied to raising oysters. But the impact up and down the value chain adds another $19.7 million to the Virginia economy. 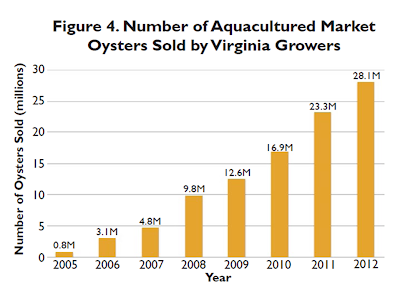 All total oysters drove $29.3 million in Virginia economic activity in 2012. One important factor is left out of this equation- that is water quality. Looking at it conservatively, an oyster filters 30 gallons of water per day. The 30 million oysters filtered 900 million gallons of water per day. This translates into 270 billion gallons of filtered water at a cost of ZERO. Imagine how many billion dollars it would cost to do it with filtration plants! A growing oyster industry is good news for the oyster and our estuaries. The people involved in the industry have a stake in maintaining water quality and the oysters. This is one reason why oyster restoration is so active in the Chesapeake Bay. There are a lot of people who have a stake in the mollusk's success. Their many voices calling for oyster restoration have lead their elected representatives to tap the Federal Budget for almost $100 million to prevent the loss of an economic engine. Mass Oyster is working as a catalyst to draw investment in our own estuaries. You can see the original report here. Of the activities we run at Mass Oyster, two types are the most popular. The fun food-oyster events such as our upcoming oyster festival at Mayflower Brewery on September 15th is one. The second type is activities that offer people the opportunity to get visit our coastline and get out on the water. Children particularly enjoy exploring our beaches and coast. To that end we are always seeking hands-on opportunities. The Massachusetts Division of Marine Fisheries have provided a great one and we are working with an affiliate, Massachusetts Baykeeper to make this happen. 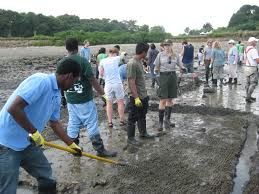 Join Mass Oyster, MassBaykeeper and the DMF in planting young clams at Quincy’s Orchard Beach. All ages can participate. We will meet on Saturday July 17th at 12:00 noon. It will be messy- Wear old sneakers or boots and old clothes. Please bring clam forks or heavy rakes if you have them.